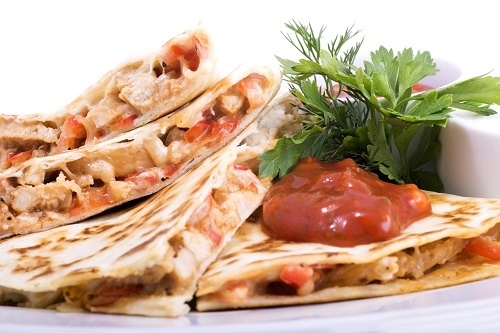 Lay out a quesadilla tortilla on a cutting board and top it with 3 ounces of mozzarella cheese and slices of tomato. Season with salt and pepper, and top off with another quesadilla to make a sandwich. Cook the sandwich on a grill at medium heat until the cheese melts. Serve with basil salad.